Haven’t decided on a hotel yet? You can look at other available hotels in South Holland and Zeeland with Booking.com. In South Holland (Zuid Holland) you may visit those iconic Dutch sites with unabashed joy! A checklist of windmills, tulips, cheese, and Delft ceramics appear straight off a “Visit the Netherlands” tourism promotion poster. 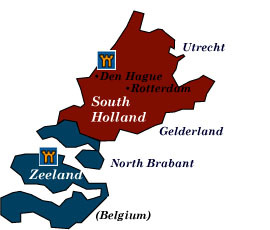 The province also holds two important cities: Rotterdam, one of Europe’s most active ports, and The Hague, seat of the Dutch government and royal family, and headquarters of international organizations such as the International Court of Justice. With a name like Zeeland, the sea has obviously played an inseparable role in shaping the lives and culture of the islands. Strips of islands jut across a vast delta, linked together by ferries, dams, bridges, and dykes. Spend your days exploring each unique island by bicycle or just enjoying nature, while sleeping the night away in a fortress hotel. Rotterdam has always been one of the major ports of Europe, but it’s not all docklands and industrial zones. Its modern architecture (most of the historical center was destroyed during World War II) houses some of the Netherlands most important cultural centers and museums. Don’t miss the kubuswoningen, the famous cube-shaped apartments built by Piet Blom, or the city icon: the 800-meter-long Erasmusbrug, designed by Ben van Berkel. Museum Boijmans van Beuningen holds one of the finest private collections in the Netherlands. All eras of European art are covered—from Jan van Eyck, Rubens, Titian and Pieter Brueghel to van Gogh, Gauguin, Kandinsky, Man Ray, and Dali. Euromast At 185 meters (607 feet) high, the 360-degree views of Rotterdam are superb. Delfshaven Historic buildings and a sailboat-filled harbor lend ambiance to one of Rotterdam’s best areas to stroll through. Warehouses are now antique shops, museums, and restaurants. Delfshaven in known in history as the port where the Dutch pilgrims left for America in 1620. For the best insight into why Rotterdam became a top trading city, visit the Museum De Dubbelde Palmboom, where displays teach us about the history of trade from Rome to the United East India Company, and Rotterdam of the 20th century. The Hague (Den Haag) Unique in that this is one of the few cities of the Netherlands not founded out of proximity to the sea or trade, its aristocratic palaces and mansions have played a role in support of government and Dutch royalty. Mauritshuis is a superb art museum holding the royal collection. Come here to see Vermeer’s Girl with a Pearl Earring, Rembrandts, and Rubens. Binnenhof Originally a 13th-century hunting lodge of the counts of Holland, parliament and government buildings are here. The best way to visit is on a one-hour tour. Museum de Gevangenpoort is installed in a 14th-century gatehouse that was once a former prison. Conditions remain much the same, with exhibitions of medieval crime and punishment. Escher in het Paleis The definitive collection of MC Escher’s works are now found in a palace that was once the home of Queen Emma. Gemeentemuseum Den Haag This municipal museum, designed by HP Berlage, is considered an architectural masterpiece. Within its walls are works by the great masters of the 19th and 20th century, including Mondrian’s unfinished Victory Boogie Woogie, as well as displays of decorative arts and musical instruments. Vredespaleis American steel maker Andrew Carnegie donated the majority of money to construct this palace that would house the International Court of Arbitration. Later the palace became the permanent home of the International Court of Justice. Guided tours only. Madurodam If you’re traveling with children, take the time to visit the little town of Madurodam. It’s a miniaturized replica of the Netherlands on a scale of 1:25, complete with windmills, canalside houses, Schiphol Airport, Amsterdam, and the Binnenhof in The Hague. Rijksmuseum van Oudheden (National Museum of Antiquities) contains one of the best collections of Egyptology in the world. Its centerpiece is the 2,000-year-old Temple of Taffeh, a gift from Egypt for the Netherlands’s contribution in rescuing Egypt’s ancient monuments during the building of the Aswan Dam. Rijksmuseum voor Volkenkunde (National Museum of Ethnology) Over 200,000 objects from every region on earth, with an exceptional collection from Indonesia, teach us about the world’s cultural achievements. Stedlijk Museum De Lakenhal Housed in the 17th-century cloth merchants’ hall, exhibits covering the importance of textiles to Leiden’s history, decorative arts, and paintings, including its showpiece: the Lucas van Leyden 16th-century triptych The Last Judgment. Naturalis Fossils, stuffed animals, precious stones, and exhibits of ecosystems are mainstays of this natural history museum. Its biggest draw, however, is the million-year-old Java Man, discovered in 1891 by Dutch anthropologist Eugène Dubois. Museum Boerhaave Early Dutch medical research was centered in Leiden. This museum includes an important collection of medical tools and instruments, including the microscopes belonging to naturalist Antonie van Leeuwenhoek. Bulb Fields From March to the end of May, flower bulbs of every glorious color burst to life. Gladioli, hyacinths, irises, lilies, and tulips are grown in the Bollenstreek, a 30-km stretch between Haarlem and Leiden, the best area to visit by car or bicycle. At Keukenhof, 32 hectares (79 acres) of stunning public gardens are filled with some 7 million bulbs of 1,500 varieties, the largest such garden in the world. In nearby Lisse, you can learn everything you need to know about bulbs at the Museum de Zwarte Tulp (or Museum of the Black Tulip). Nieuwe Kerk (New Church) is where you’ll find the crypt of the House of Orange, including the mausoleum of William the Silent. In the Oude Kerk (Old Church), you may visit the tomb of Vermeer. Museum Het Prinsenhof was a former convent that became the palace of Willem the Silent. He was assassinated here in 1584, and you can still see the bullet holes at the bottom of the stairs. The palace now holds a museum with exhibits and historical collections about the Eighty Years’ War and the House of Orange. Museum Nusantara highlights the role of the Dutch during its rule over Batavia (Indonesia), its history and culture. Included are exhibits of furniture, masks, shadow puppets, and Javanese gamelan instruments. Legermuseum Two restored 17th-century arsenals hold important collections detailing the development of the military history of the Netherlands. Weapons, uniforms, and armor from the Roman period, through the Eighty Years’ War, the two World Wars, and the Bosnian peacekeeping force are highlighted. Kinderdijk If you want to see windmills out in the countryside, Kinderdijk is the postcard snapshot with nineteen windmills stretched along both sides of the canals. They were declared a UNESCO World Heritage Site in 1997. Gouda An easy day trip in the area, Gouda is not only famous for its cheese markets in the main square, but for the stained-glass windows of St. Janskerk, which illustrate biblical subjects and those of history, such as the siege of Leiden in 1547 and the Liberation of the Netherlands in 1945. Slot Loevestein is a well-preserved 14th-century, moated castle that has served as a toll castle and a prison. From Woudrichem, you can catch a ferry if you’re on foot. Cultural events are occasionally held. Historic towns Considered the oldest town in the Netherlands, Dordrecht has a pleasant old town in which to walk around. Climb the tower of the Grote Kerk for a fantastic view. All of Nieuwpoort has been declared an historical listed area with its still intact, fortified town walls. Brielle is a fortified historic town on the island of Voorne. Middelburg Rebuilt from the ashes of World War II, the historic center of this provincial capital still evokes the atmosphere of its Golden Age when ships of the Dutch East India Company tied along the quays at Londensekaai, Rouaansekaai, and Rotterdamsekaai. Government offices and churches are housed in the Abdij, an enormous, 12th-century abbey complex, built on the site of a Carolingian castle. Inside you’ll also find the Zeeuws Museum, which displays excellent collections of decorative art, tapestries, costumes, and historical exhibits of Zeeland. Veere is a delightful town to stroll around—past sail boats in the harbor to the Gothic town hall and the 16th-century Schotse Huizen, which once belonged to prosperous Scottish wool traders. Along the harbor, you’ll see a 15th-century fortified tower, the Campveerse Toren, now an historical “castle” hotel and restaurant. Deltapark Neeltje Jans To look up close at the massive efforts the Netherlands resorted to in preventing a repeat of the disastrous 1953 flooding, which claimed 2,000 lives, the Waterland Neeltje Jans is the place to come. It’s actually a theme park with the usual water parks and thrill rides, but there are exhibits about the Delta Project, a nearly 40-year project to construct 3 km of movable barriers that can be lowered in the event of a coming storm. You can even take a boat trip out to the barriers. Zierikzee If you’re looking for one more charming town to stroll around in, Zierikzee offers over 500 hundred listed houses. Gravensteen was once a 16th-century prison, but is now a maritime museum. The Noordhavenpoort is an old city gate dating back to the 16th century as well.